I remember sitting after school with a female friend of mine. I was helping her with some trigonometry homework and decided to bring up another problem – one unrelated to the unit circle and pi. “So, comparative government has been kind of crazy lately, don’t you think?” I asked, turning to look at her. “Yeah, with the election and everything everyone’s been kind of politically charged,” she replied. Let me make myself clear – I’m not the type of guy who makes assumptions without evidence. But, to put it bluntly, I thought that maybe – maybe – this female friend of mine might have had a teeny crush on me. Me, as in, a homosexual. From inviting me to Homecoming, to casually consistent brushes and touches, to other questionable remarks, the evidence added up. I wasn’t sure, and I’m still not sure, but after months of waiting I wanted to establish the firm boundary of friendship before things got ugly. I am aware that this tweet was taken before the election, it’s great that President Obama won! 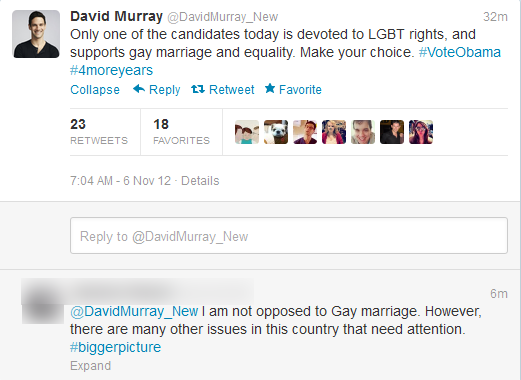 Lately, I’ve heard a lot of people say that gay rights isn’t a “big picture” issue. They say that things like the economy or foreign affairs matters more, and that being gay only affects a limited amount of people – so, it should be shoved aside until our country can resolve other problems. I understand that people have priorities and certain things that affect them. Everyone is supposed to care about different subjects, and people are supposed to disagree, otherwise, nothing new would arise. I understand that money has a huge effect on our country’s prosperity and its overall position in the world – it’s truly unfortunate that so many people are struggling to make ends meet.